In the area of north-east Lomellina, the terraced land that slopes down to the bed of the river Ticino, Vigevano unfolds before the tourists with its suggestive monuments of the Middle Ages and the Renaissance. This town, worldwide famous as industrial centre and "capital" of the footwear production, boasts works of art such as the Ducal square, one the most beautiful piazzas in Italy, and the Castle, that stands out among all others in Lombardy. 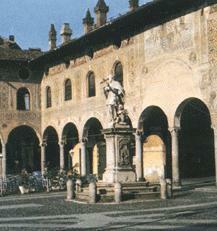 The most ancient heart of Vigevano dates back to the early Middle Ages. At that time it was a fortified town nearby a ford in the river Ticino. 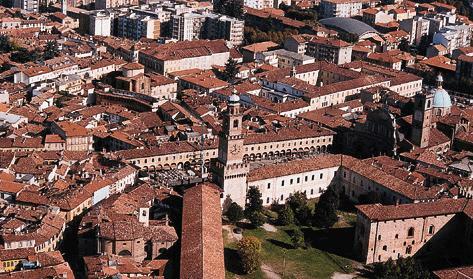 The town became a free city state and due to its strategic position, also became the object of conflict between Pavia and Milan. The town fell under the rule of the noble family Della Torre and entered its golden era starting from the XIV century under the Viscontis and, from midway through the fifteenth century, under the Sforza family becoming ducal city, a thriving centre for traders and skilled crafts-men and a Bishop'sseat. For centuries the town was an important centre for textiles, particularly silk and wool. However, in the second half of the nineteenth century, textile production made way for the shoe manufacturing industry. Today, Vigevano is still the most important town in Italy for footwear manufacturing generally. 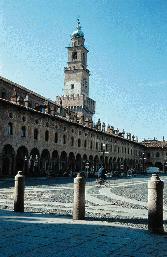 Vigevano has a strategic position: almost at the same distance from Milan (35 Km), Novara and Pavia. The West highway intersects with the road SS 494 that links Vigevano with Milan; the motorway A4 from Turin branches off at Galliate and the motorway A7 from Genua at Gropello Cairoli, both close to the town. It is easy to get to Vigevano from Alessandria and Milan by rail too. The castle, which rises up at the town's highest point, is grafted on to the planimetric foundation and structure of the pre-existing walled city dating back to the twelfth and thirteenth centuries. The castle was built in two important and consecutive stages, one under the Viscontis and the other under the Sforzas. 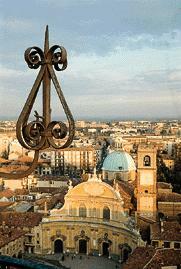 The first was prompted by the mayor of Vigevano, Luchino Visconti. In 1341 he ordered the building of the "Rocca Vecchia", a fortress for keeping watch over the road to Milan. Then, in 1345, he instigated the building of the castle itself, the present "Maschio", which was quadrilateral in shape and had four angular towers. Two years later, the two forts were linked by the strada coperta, a great raised and fortified thoroughfare which extended across the town and made it possible to pass quickly from the castle to the open countryside beyond. It was a remarkable achievement,164 metres long and 7 metres wide. The construction stage under the Sforzas has become significant due to the artistic contribution of Donato Bramante. In this period, the castle took on the traits of a magnificent princely residence and acquired the splendour due to it as one of Europe's richest Renaissance courts. In the two year period from 1492 -1494, Duke Ludovico Maria Sforza, known as "il Moro", instigated the completion of the stables, the tower made up of graduated parts, and the fine colonnades of the "falconiera". The latter was thus called because it was the place used to breed falcons and train them to hunt. 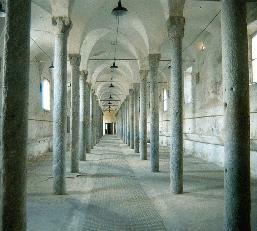 The stables, the building of which had been started by Galeazzo Maria, could accommodate a thousand horses. A residential wing for the Duchess was added to the rear part of the "Maschio" and the elegant "Loggia delle Dame" was erected. 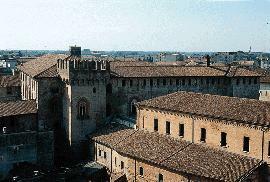 At the end of the Sforza dynasty the castle was surrendered to the Spanish. This marked the beginning of a gradual decline; it went on to be used as army barracks for more than three centuries. The castle is currently undergoing restoration work. The tower is situated at the town's highest point. It was built in several phases; construction began in 1198 and was finally completed by Bramante at the end of the fifteenth century. The tower, which has an unusual shape "filaretiana" in style, is made up of graduated parts. From its battlements there is a fine view over the piazza, the castle and the whole of the town. Designed by Bramante, this is one of Italy's most beautiful piazzas. The building of it was instigated by Duke Ludovico il Moro and work began in 1492. It was intended to serve as a stately forecourt to the castle. It is one of the earliest types of Renaissance piazza and also one of the few examples of a piazza conceived as a single piece of architecture. All in all, it can be regarded as one of the most complete urbanistic achievements to emerge in Lombardy in the whole of the fifteenth century. The piazza is the shape of an elongated rectangle measuring 134 metres by 48 metres. It is enclosed with arched porticos supported by 84 columns. The porticos have carved capitals, all of which are different. Originally, at the foot of the tower, where a flight of steps now leads up into the castle, there was a gap in the chain of porticos and a ramp, which could be crossed on horseback as well as on foot, rose from the centre of the piazza to the main castle gate, the grand entrance to the royal palace. In 1680, bishop Juan Caramuel Lobkowitz had the ramp removed and porticos built in its place so that the chain ran uninterrupted. The baroque façade of the cathedral was erected, thus enclosing the fourth side of the square. This façade is curved and aligned with the axis of the piazza, hiding the fact that the church building behind is off-centre. The pictorial decoration dating back to the sixteenth century was repainted in the early 1900's using bright colours and patterns. The result is an illusionistic effect created by architectural detail, mythological figures, floral designs, ducal coats of arms and a series of medallions depicting members of the ducal family, great figures from classical history and strange fifteenth century mottos. The cathedral which is dedicated to Saint Ambrose was designed by Antonio da Lonate. It was started in 1532 by Duke Francesco II and was not completed until 1606. The Latin cross interior, which has a nave and two aisles, contains some remarkable works of art. 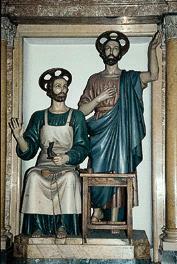 In particular, in the first altar recess on the left of the entrance there is Antonio da Lonate's wooden model of the church. In the third side altar recess on the left there is a tempera polyptych from the school of Leonardo and on the high altar there is an eighteenth century altar frontal which has figures embroidered in silk and gold and parts salvaged from a set of sixteenth century vestments. In the right transept there are valuable paintings said to be the work of Macrino d'Alba and Bernardino Ferrari (early sixteenth century). CATHEDRAL MUSEUM. 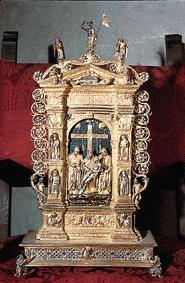 Most of the exhibits contained in the Cathedral Treasure Museum are gifts donated by Francesco II Sforza (1534). The museum is the home of precious choir-books and manuscripts illuminated by Agostino and Ferrante Decio, a valuable ivory bishop's crook, "La Pace" - a priceless silver reliquary engraved in gold by the master goldsmith Benvenuto Cellini, chalices and reliquaries from various eras, Flemish tapestries produced in the tapestry works of Brussels (1520) and Oudenaarde (early seventeenth century) and featuring characters both religious and profane. There is also a sixteenth century vestment embroidered in pure gold and used at Monza in 1805 for the coronation of Napoleon Bonaparte. 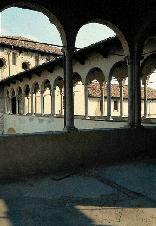 The church was designed in Lombard Gothic style in fourteenth century by Bartolino da Novara. It has been altered and restored a number of time. In the fifteenth century it was linked to the castle, acting as its chapel. Il was adjacent to the Dominican monastery which was the home of the blessed Matteo Carreri, the patron saint of the town, and which was, in 1696, the place where the French and the Austrians signed the Pace di Vigevano, thus putting an end to six year of war. The church, built in Lombard Gothic style, dates back to the time of Sforzas. Opposite the main entrance of the church there is an attractive fountain with a statue of the saint made by Giovan Battista Ricci. The museum came into being as the result of a donation by the Bertolini family and was opened in 1972. The collection currently comprises around 300 shoes and provides a unique look at the history of footwear from three angles: footwear as a part of dress, footwear through the ages and footwear of different civilisations. The historical section contains exhibits dating from the fifteenth century to the present day and includes items of footwear which belonged to famous figures in history, eg. a slipper which belonged to Beatrice d'Este, and army boots. In the etnographic section you can see footwear worn by the different peoples of the earth; the collection includes African sandals, Indian and Eskimo mocassins, Arabian babouches, Chinese slippers, Japanese guetas and Balkan opanke. Finally, there are the curiosities. In this section you can see cobblers tools, strange shoes and peculiar inventions, as well as a remarkable collection of publications on the subjects footwear and footwear manufacturing.